by Dave from The Longest Way Home ~ January 17th, 2018. Updated on March 26th, 2018. Published in: Travel blog » Nepal. After crossing the India Nepal border in Sunauli, Pokhara’s Lakeside was my first destination over ten years ago in Nepal. I was expecting a commercial tourist hub but instead got a near on idyllic lakeside township. Unlike other towns along a lake, Pokhara was highlighted even more by the majestic Annapurna mountain range forming a masterful snowcapped backdrop to the scenic lake. Update: about 6 weeks after this article Pokhara banned vehicles during weekends along Lakeside. Glad to hear someone was listening. How long will it last? Who knows… but, at least it’s a start. Back then local trekking stores and souvenirs shops along lakeside road played Om-madi-padme-hum which flowed into the street whenever the electricity was on. A wonderful first impression if the weather was good and the mountains were in the background. The somewhat ramshackle stores and little wooden cafes blended in with the odd cow meandering down the road looking for leftovers. Pokhara was never for the party animals though. Granted, like Thamel, the hard rock beats of AC/DC rang out from bars that often closed up at 9pm. Aside those, a few bars were always happy to stay open until you stopped ordering beers no matter the hour. The next day heavy load shedding (power cuts) often meant a long wait for that morning espresso (from the one or two places that had a machine back then). Still, breakfast by the lakeshore was blissfully quiet and scenic under the gaze of Pokhara’s world peace pagoda above. Everything moved slower in Pokhara. If coming back from a trek this was a good place to relax. If preparing for a trek it was good place to take it easy and prepare. There was never any rush in Pokhara and everything was laid back. 10 years ago paragliders used to land right alongside the main lakeside area as cows meandered by. Today this area has been closed off to paragliders as they are pushed back to Happy Village and a landing zone … as for cows? Yes, they too have been blocked off from this area which is soon to become a built up commercial zone. Those were my first experiences of Pokhara’s Lakeside some 10 years ago. Today, Pokhara is known as Nepal’s number one resort town. It’s changed phenomenally. 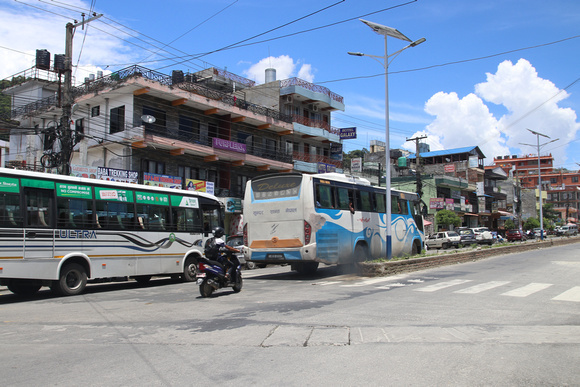 Similar to Thamel in Kathmandu, Pokhara’s Lakeside has taken a slightly different turn than expected in development. Has Pokhara gone the way of so many lakeside townships around the world and become swallowed up by greed and pollution. Or did Pokhara manage to hold onto the old traditional ways and blend them with the new? When did Lakeside start to change? Pokhara is not that old. First mentions of it began in the 18th century when the Newars from the Kathmandu Valley began expanding to what was once a small trading village with Tibet. With roads came greater trade but as the Malla empire fell the Pokhara remained relatively closed off. In the 1970s trekking tourism opened up and tourists quickly discovered Lake Phewa in Pokhara which was set under the magnificent Annapurna mountain range. The town was the ideal base for trekkers heading into the Annapurna mountains. Commercial tourism got its grip on Lakeside and never let go again. All along Lakeside old buildings are being torn down as rents go up three fold so only “certain” people can afford them. For me I was always worried about Pokhara. If you’ve ever traveled to developing countries lakeside townships you’ll know what I mean. It’s very difficult to control the rage of commercial growth and profit yet still manage to hold on to what made the location so popular in the first place. Peace, quite and scenic beauty. The first big change I noticed did not occur until 2011 when traffic and parking along the main Lakeside road became the norm. The road is wider than Kathmandu’s but motorbikes were everywhere despite a previous years forgotten promise of no parking along Lakeside. Then in 2013 came the Chinese tour buses and the rumors that the old quaint farmer tractors would be banned in Lakeside. Cows were being pushed out too as posh restaurants slapped the bovines away. Still, the holy cows were welcomed and petted further north in the backpacker area known as Happy Village. Old values that endeared Pokhara to tourists started to be ignored in favor of getting as many tourists into Pokhara at any cost. New hotels were being constructed at every corner and seemed to outnumber tourists twofold. 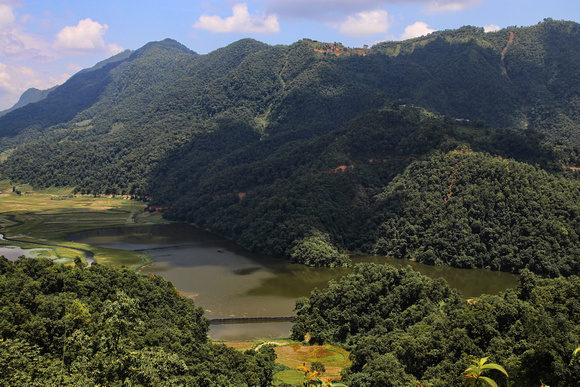 I noticed the mountain range behind lake Phewa had not been clearly visible throughout several seasons. Lost in a cloud of haze that ranged from slightly hazy to impenetrable. Locals insisted it was just for those few days. Pokhara citizens have one of the worst habits in all Nepal of claiming everything is better in Pokhara. But the truth was I had not seen the whole mountain range behind the lake clearly since 2008. Yes, there are still clear days during peak season but during the pristine winter months those peaks are getting masked by haze. In 2014 Lake Phewas waters also began to change. From a natural clear brown it moved to a grey color. Pipes crisscrossed the shallow waters edge and nobody could still answer where the sewage system ran to in Lakeside. Rumors of dumping grew and fishermen had packed up to move elsewhere. On a positive note there is now a brick pavement running most of the way along “lakeside” and in 2017 little shelters like this are popping up – no seats or bins and surely a little man chasing for rent money – the lakes color is decidedly green compared to 10 years ago. Locals say it’s the time of the year that makes it go green – sadly they’ve been saying that throughout the year for the past few years – much like the popular “mountains over the lake” poster that adorns many a travel agent. Again, sadly, those mountains have been getting hazier and hazier every year for the past five years. There are now better views in nearby lakes. Today the lake is more green than grey with algae and waterlillies taking hold constantly. While Lake Phewa has not been a swimming lake since the 80s now it’s barely useful for clothes washing. Back from the lake street dogs were even more of a menace than in Thamel despite a cull in 2006. At night barking dogs ran amok and tourists complained of disturbances while trying to sleep or worse again of dog bites. Hotel construction continued on unabashed. Chinese tourists powered into Lakeside on huge tourists buses that were meant to be banned. But it was all ignored in the hope that the tour operator would send the 36 seat passengers to a certain shop or restaurant. Kathmandu’s darker side also arrived into Lakeside as hashish sellers now dared to brush up to you with the words “hashish, you want smoke, weed, take it …”. Their rough nature highlighted more so due to Lakesides quieter feel. So to was the aspect of growing gangs of glue sniffers and youthful gangs. Nearly 10,000 people lost their lives during the 7.8 earthquake in April 2015, Most of Lakeside survived with no damage at all. 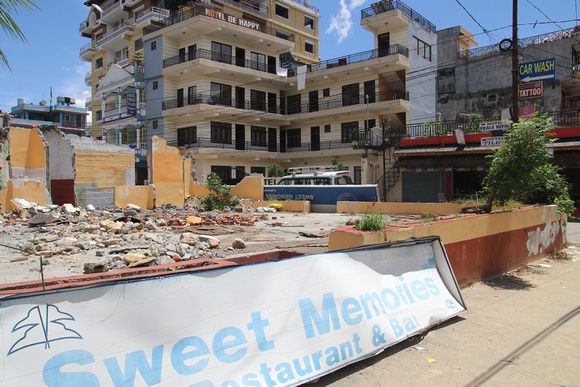 Indeed even in Pokhara city itself where few tourists go there was little damage. By and large Pokhara itself escaped direct physical damage. Though aftershocks rocked the tall hotels for the next 6 months and surrounding villages were destroyed the tourist resort town itself was not physically effected. Following the 2015 earthquake even more tour buses started to appear along lakeside filled with Chinese, Indian and western student tourists. These buses used to be banned from Lakeside but now are making regular appearances and blocking roads as they drop tourists off. In the year that followed, Pokhara, like the rest of the country, suffered a lull in international tourist numbers. That said, it began to receive an unexpected boost in domestic tourism. Norris from Ramba pharmacy has been here for over 10 years – in 2017 his rent went up an astronomical three times as much as he had been paying. It’s the tale of many older shop keepers along Lakeside. 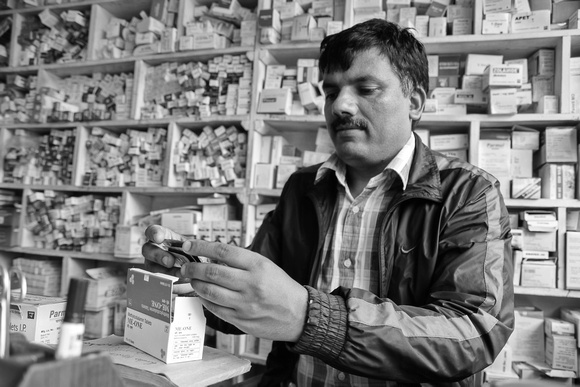 Ramba Pharmacy has been one of the best pharmacies I’ve come across and is in my guidebook to Nepal. By 2017 rent along the main Lakeside road had tripled. Old stores were forced to close and were replaced in under a month by large plush boutique shops, hotels and restaurants. The Chinese were gone and the Indians didn’t like the constant disdain they felt directed at them post earthquake. Domestic tourism took over from international tourism. Boutique pashmina stores and handicraft stores are popping up all over lakeside in 2017. USD$50 for a “pachmina” scarf that you could buy in Thamel for $5 – though it won’t come with such a pretty bag. Who can afford these prices? Nepali can these days. Friday nights in Lakeside became dominated by affluent young Nepali youths taking a weekend break from Kathmandu. Most would fly in or arrive up in new SUVs, money not being an object. Bars were the main focus and nightclubs thereafter. Those special treat expensive restaurants for most trekkers were now filled with Nepal’s new generation with little care in the world. Away from their parents eyes the party lifestyle could be had in Pokhara on a Friday and Saturday with few restrictions. Hoteliers and restaurateurs bent to their will. There are hushed whispers among the brave that Pokhara has become the chosen place for turning 2015s influx of donation money into clean concrete “re-investments”. 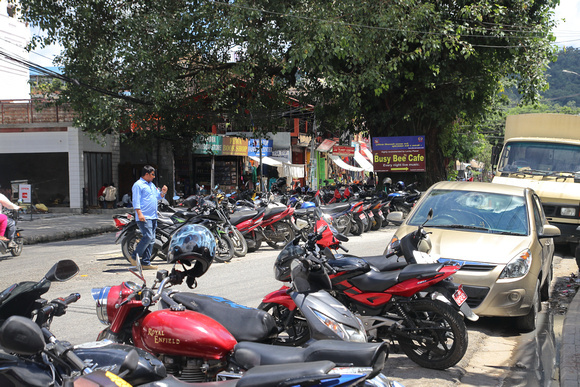 As I stayed for New Years in Pokhara the main street was jammed with Nepali enjoying overpriced food and beers. There was barely another foreigner in sight. Those that were here seeked out the budget area of Lakeside for some peace, quiet and sensible pricing. 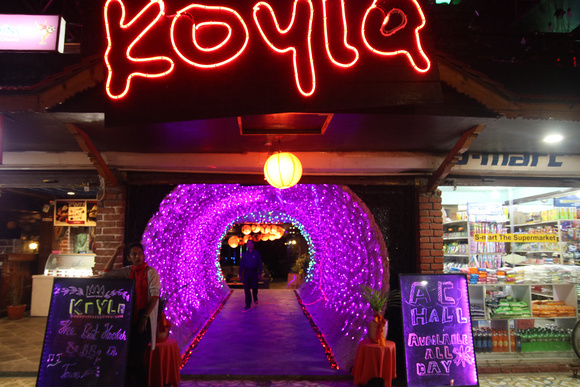 A new BBQ/Nightspot opened up along Lakeside with a rather double entendre bright neon purple tunnel for an entrance – they are focusing on rich Nepali youth rather then Pokhara’s previous clientèle of western trekkers … the prices inside are at the same level as European counterparts. In mid-2017 along Lakeside it’s KFC that attracts the most customers … Nepali so happy to have such a prestigious “restaurant”. Down the road is a new nightclub which remains empty on weekdays but on a Friday night is thumping out techno music, BBQ and beers over bright lights. Is it enough to cover it’s alleged USD$4,000 month rental though? Nobody seems to care. It’s this sky-high rental increase that’s bringing about the most change. Old favorites here for decades are being torn down for boutique stores or shell like hotels. Those old timer Nepali businesses with enough cash left are running for the northern part of the lake. The others who challenge the affluent new comers are largely sporting empty seats as they can’t match the “connections” of the affluent. New pleasant restaurants have opened up with a nice ambiance along the lake – however you’ll be hard pressed to enjoy peace and serenity on a Friday night as the neighbors thump out techno beats. Gone are the days of Om-madi-padmi-hum in Pokhara. Construction of massive hotels. New boutique hotels and stores. Well connected yet empty plush new buildings are popping up everywhere. It’s a similar trend to what is now happening in Thamel. Western trekkers are still found are along lakeside but they are no longer the prime visitors. Volunteers coming down from nearby towns for a night out are now more visible. But trekkers are harder to spot on these nights. Return trekkers from years gone by are largely staying in quieter areas or the budget area of Lakeside. Priced out of the Nepali section or largely confused or simply trying to avoid this momentous change. It’s not all bad though. The trees planted along the lake are now growing well and provide shade and support for the lake front. There’s a bevy of new BBQ and nighttime food courts there too. 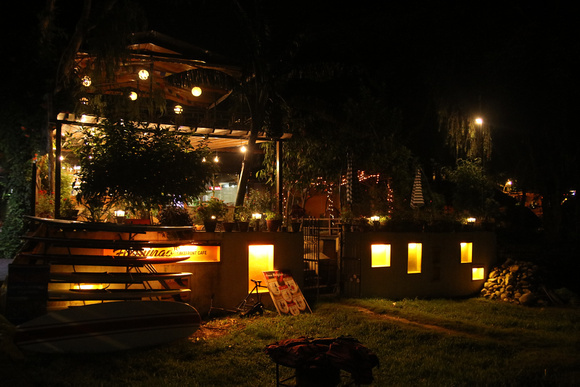 The stone paved path runs along most of the lake under the gaze of harsh Chinese donated solar lights. Then abruptly stops. Not quite finished. But, it’s an improvement of sorts. Smart tourists and those on a budget seeking peace and more tradition head to the end of Lakeside before the turn to the northern section and onwards Happy Village. In this northern section of Lakeside things are more relaxed. The food is cheap, good and the locals are still up for a chat compared to the well dressed waiters in the middle and southern section of Lakeside who try so very hard to get you to come inside. 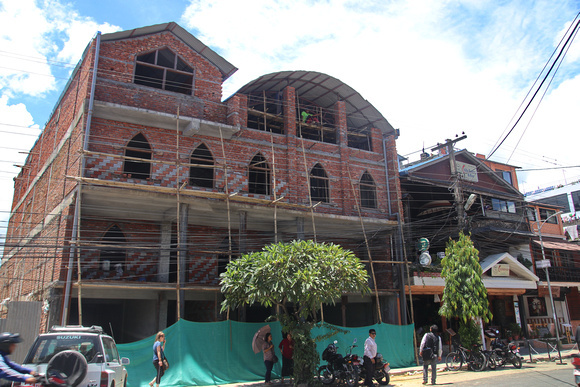 Everywhere you go in Pokhara’s Lakeside there’s a new building being constructed … strangely many of these affluent places are deserted most of the time once they are opened … aside that is when the owners “friends” are in town. There’s a privately sponsored lookout tower by the lake to help rescue people who go out boating. There are new paddle boats and water balling activities. There’s a new climbing wall on the way. There’s no shortage of accommodation whatsoever. Far from it. Police are more evident around Lakeside these days too. A good thing considering the hoteliers are reporting a 400% increase in breakins over the past year. A worrying trend for Nepal considering it once held a very “safe” reputation. 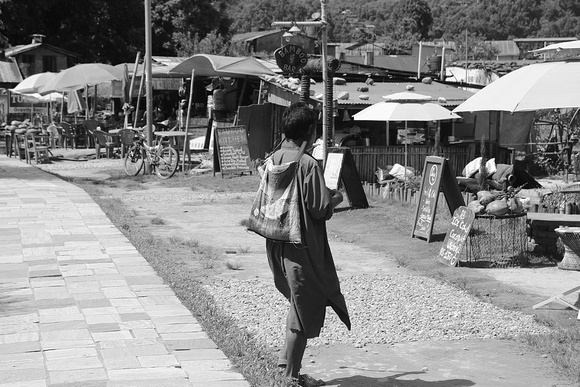 Homelessness, begging, theft and drugs has also made its way into Pokhara’s lakeside. Many Nepali say these are Indians – however, many look and speak Nepali very well – especially the drug pushers. What’s missing along Lakeside? Cows. A few of these holy animals still walk the northern end of lakeside. But fences and barriers block them from entering the lakeside shore area. Gone are the days of a cow coming up to you at breakfast looking for a treat. Likewise the paragliders have been pushed back to the Happy Village side for their landing spots. No more paragliders landing near your lakeside table. The wonderful sound of Omadi- Padme-Hum has also near on vanished. This year I counted just one small Tibetan shop that still plays this tune outside it’s shop front. A terrible shame as now Pokhara’s lakeside is becoming slightly generic in terms of “resort towns”. Since day one I figured Lakeside would go this way. It was inevitable in a way. Here are some predictions on how Pokhara’s Lakeside will develop in the future. 1) More and more hotels will be built. Many will remain empty or near on empty for most of the year. But it won’t matter as they are more for show and investment than occupancy. The lake will become so polluted and the mountains so hard to see that people will turn their backs on Pokhara and the city will become a virtually empty town. 2) Lakeside becomes a boutique shopping zone and exclusive night spot for wealthy Nepali, Indian and Chinese tour groups. Meanwhile the western trekkers and those seeking value for money will move north along Lakeside and into Happy Village. 3) Strong building regulations and rent control will be enforced allowing local business to survive. An emphasis will be put on rural, cleanliness and eco-friendly lake activities. Lakeside will ban all traffic aside from old farming aids and cows. Rupa lake is very close to Pokhara’s Phewa lake and is virtually (totally) untouched by tourism – it offers a great little outing for those that want some peace & quiet. While nearby Begnas lake is nearly exactly how Lakeside was 20 years ago. Of these three options the first is a serious contender given Pokhara’s current status. The second option is probably the most likely and certainly my best guess. The third option is the best option which is sadly very far away at the moment. Every time a new concrete hotel is constructed along Lakeside, more and more international tourists move further away to new destinations. 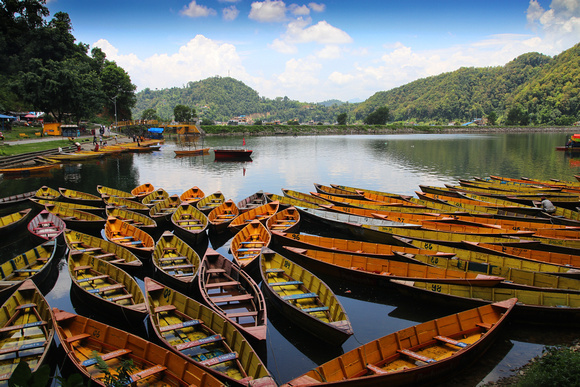 The truth is there’s a lot more to do around Pokhara than just the lake. But few people dare to venture out. There are other lakes. Begnas lake is only 30 mins away. The boating there is much more pleasant. It’s like Lakeside but 20 years ago. Avoid Saturdays though as it’s crowded with locals. Just a little further away is the pristine Rupa lake which is epic in that the local community have banned hotels from being set up around it. The best way to experience Rupa is to hire a mountain bike, motorbike or car to drive out there. A bus will take you there, but the best parts of the lake are in the remoter areas around it. The Newar Bazar just a short walk from Pokhara’s lakeside is a lovely untouched peaceful place that you can easily visit without a tour guide – most locals from Pokhara will say it’s not worth it, a sad case of the caste (ethnic) divide, but if you like temples it’s worth a half day outing. 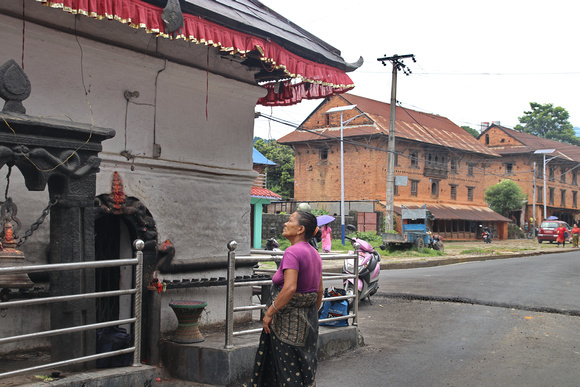 Visit the Newar bazar near New Road in Pokhara to see the last of the old 18th century Newari buildings before they collapse. This is also where Pokhara’s main city area is. The side of the city few tourists get to see. It’s not beautiful but the people are strangely more friendly than those along lakesides main strip who seem only interested in you buying a meal, staying in a hotel or purchasing an overpriced souvenir. There are also museums like the Gurkha museum and the international Mountaineering museum which are excellent places to visit around Pokahra. 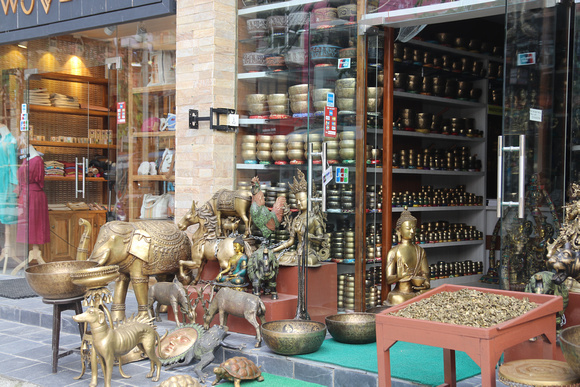 The “Tibetan” refugee camps are not so traditional anymore though – the people here are well settled now and they are mainly for package tour guides who bring you here to buy a carpet these days. Alternatively stay in the once affluent Damside area right next to Lakeside to get away from all tourists. It’s so very quite here as it lost out on the battle to win tourists away some 10 years ago. But there’s virtually no commercial aspect here. Just a few old guesthouses, the German Bakery and a couple of local eating places. 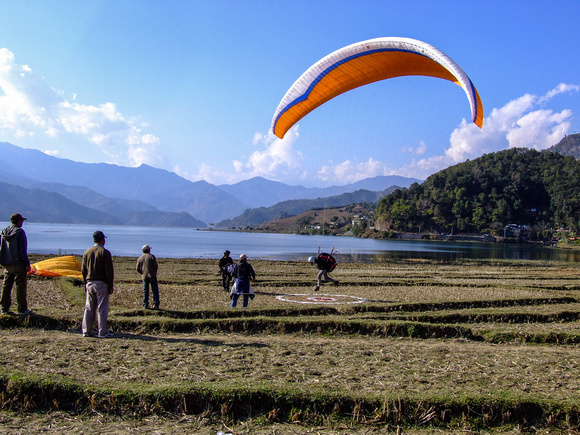 Walk or bicycle out past Happy Village and the paraglider landing spots to more the pristine areas in Pame or just outside this village for river views not unlike those you’ll spot in the Annapurna Mountains. Use Lakeside as a base for other places to get the best of both worlds! No, this is not a bitter memory post. Pokhara’s Lakeside has certainly changed over the past ten years. Some will say that it’s simply development. Others will say it’s biased to always think of it as a trekkers place. Others again say it’s Nepali so let the big commercial property owners profit with domestic tourists along with package tourists from India and China. But let’s not what forget what put this iconic area on the map in the first place. Recording such a change may help it and neighboring places in the future. Just like Rupa lake banning hotels from being built along its shores. If you visited lakeside before or are looking for peaceful surroundings, just head to the northern section of Lakeside to feel like it once was – or like I mentioned go to Begnas or Rupa lake. No this is not Lake Phewa, this is the far side of Begnas Lake which is only a 20 minute drive or 30 minute bus trip from Lakeside – the boats are cheaper to rent, the place is more peaceful and it’s just like Lakeside used to be 20 years ago! 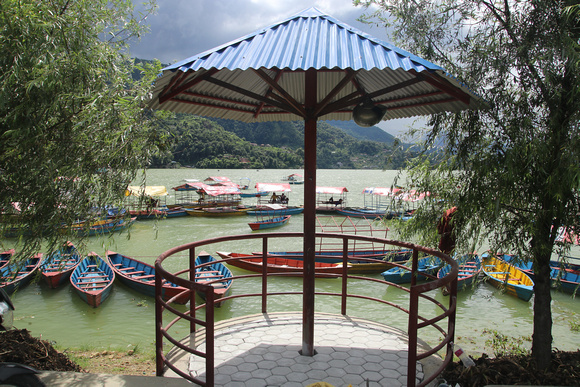 Using Lakeside as a base for trips to places like this is the new thing to do in Pokhara for many independent tourists! Full details in my guidebooks to Pokhara and Nepal. Lakeside still remains an ideal place before you trek or after it in terms of spas, cafes, restaurants and shopping. But for those seeking nature I would suggest you broaden your scope and visit the other lakes mentioned here. Moreover the irony in a lot of this development is that accommodation is still cheap in Lakeside is still relatively cheap due the many hotels being built. You’ve just got to find the right places away from the affluent new hotels that have sprung up. See below for more on this. If you’ve never visited Pokhara before perhaps you’ll enjoy what is quickly becoming a very modern tourist resort. I’ve adapted to this change. I have to as I continuously update the very best guidebooks to Nepal to help others like you take their own first steps into new adventures and discoveries in and around Lakeside in Pokhara. 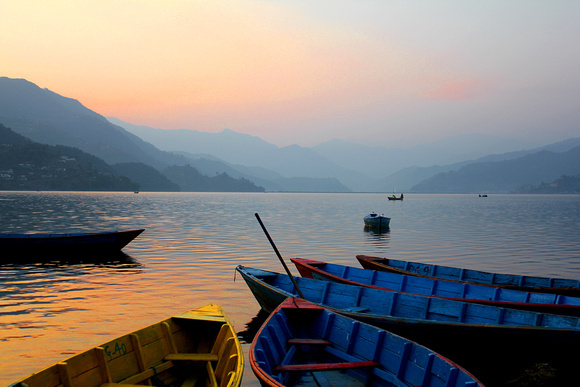 No matter what you like, Pokhara can easily be the highlight of your trip of a lifetime. Get my Guidebook to Nepal & discover more than anyone else! Find out more about places like this with the most up-to-date, popular and dedicated guidebook to Nepal in the world. Over 550 pages, 110 maps & 900+ photographs of every temple listed plus photos of every day on all the treks shown, jungle safaris and so much more. Take a look below and you’ll find out why this beats all other guidebooks! Great write-up! Very few people write about the positives and the negatives of a place like this. Not a single sell of a tour package either! That’s why I enjoy reading here! Thanks for reading Karla. I could just hype a place up, but tourism board’s and bloggers on free trips do all that. If I’m going to a place, I’d much rather get an impartial Dependant look at a place. Out of interest, do you think it will change for the better? Or is it all about greed? Honestly? At the moment, it’s greed. It will take a while for genuine social causes to work into things. Visited here 16 years ago. What a change … memories are sometimes best left in the past I think. You mentioned it happens all over the world. I’ve visited a few places and agree. It’s sad. Makes you not want to tell the world about a place anymore. Believe it or not, this was one of my biggest dilemmas many years ago. Writing about a place very few people knew about. The way it works, sadly, is if you don’t, then someone else will. And, as I don’t take paid or sponsors etc then at least people know what they get here will be 100% genuine. It’s a good start for those who really want to discover something “new”. Documentation on destinations like this is awesome. Well done for the initiative. I work in the travel industry stateside and being able to proof resort towns like this and their development over a set period is great. Thank you. Yes, documenting a place is important. Right on with the overflow of Chinese. Can’t they just restrict the numbers like in Thailand? No, they’d lose the money. But long-term, they’ve already lost. Yes Billy, you got it! I visited last year. It was not what I expect. More like this. Rupa lake was very nice but if bicycle service in car to get there better. Taking a bicycle to Rupa lake is the best way if you are fit! This is tough to see sometimes. Especially when spots begin to become overrun. Still seems like Pokhara has some charm but nothing like your first visit 10 years ago. I would have loved seeing the cows around town back then. Oh well. There still are cows, but mainly in the northern section. » What’s the best travel insurance for trekking in Nepal?